Very good phenotype and structure in this A241 daughter. The donor dam A837 is by Dimension 7127 out of the imported Finks Miss embryos. We have four of her progeny currently in the herd. 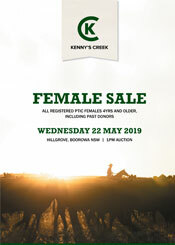 Sold pregnancy tested in calf to Kenny's Creek M1 with an AI male fetus.